FTP stands for File Transfer Protocol. It is used to transfer files between a client (a computer) and a server (where files are hosted). One major use for FTP is uploading images to your website. For instance, you could change the banner image on your homepage using FTP. There are several FTP clients available, but we recommend Filezilla. You can find it for download here. Click on the Open Site Manager button located just below File. If you host with us, and don't have this information available, you can submit a ticket here to have it sent to you. If you do not host with us, please contact your hosting provider and request this information. Change Logon Type dropdown to Normal. Enter username and password. If you do not have this information, you can use the same resources in step 3 to find it. Click connect. 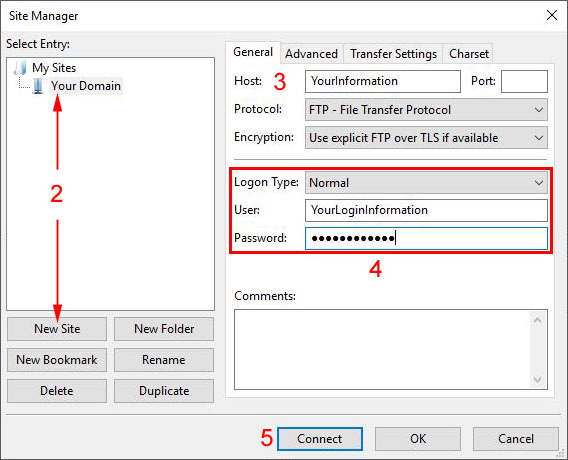 This will connect the client to your FTP server, and save the connection information. You can disconnect from the Server dropdown menu at the top, or by closing the FTP client. Once you've connected, there should be four windows displayed, two long rectangles at the top and bottom, and two squares in the middle of the screen. The top rectangle is the Connection window, which displays connection status and information. The left square is the file structure of the computer you are using, the right square is the file structure of the server you are connected to. 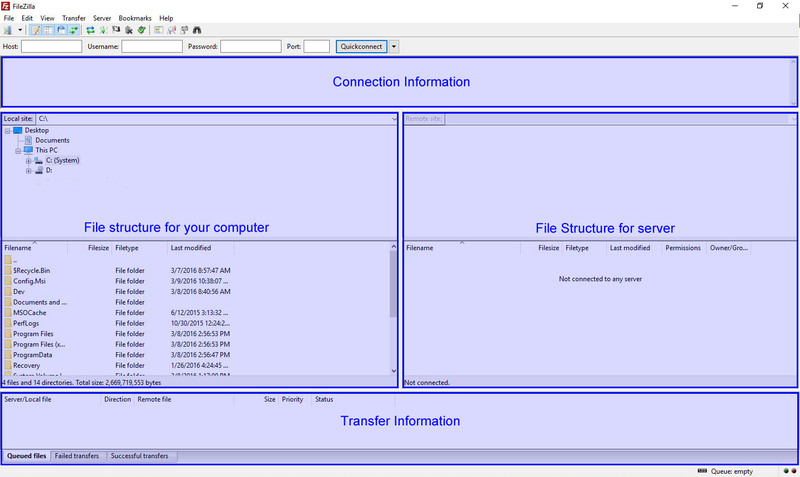 The bottom rectangle is the "Transfer" window, which displays information about files you are transferring from one location to the other. To transfer a file from one location (your computer, or the server) navigate to where the file is located currently on one side (i.e. your computer window), and navigate to where the file is going on the other (i.e. web server window). Then, click on the file in it's current location and drag it to it's destination on the other side. In the transfer window you will see a progress bar and other information about the transfer. When the bar is complete and you see 100% your file has been transferred. After you've complete the initial set up in the file manager, you don't have to repeat this process. You can simply open Filezilla, click the down arrow next to the file manager button to see a dropdown of available servers, and click the one you want. It will automatically connect using the previously entered information.